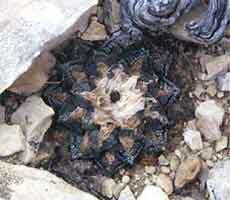 Ariocarpus fissuratus, near Alpine Texas. 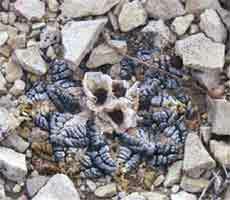 Ariocarpus fissuratus, a large plant from the population near Alpine. A large population of plants near Alpine growing on a series of low creamy-white limestone hills. Many small and several medium sized plants to about 5-6cm in diameter arre accompanied by Echinocereus russanthus and E. dasyacanthus. This is probably an immense population as the hills extend as far as the eye can see.